This blog originally was published at ITSMportal.com on July 14st , 2010 IT vendor lock-in is as old as the IT industry itself. IT vendor lock-in is as old as the IT industry itself. Some may even argue that lock-in is unavoidable when using any IT solution, regardless of whether we use it “on premise” or “as a service”. To determine whether this is the case, we examine traditional lock-in and the to-be-expected impact of cloud computing. Horizontal lock-in: This restricts the ability to replace a product with a comparable or competitive product. If I choose solution A (let’s for example take a CRM solution or a development platform), then I will need to migrate my data and/or code, retrain my users and rebuild the integrations to my other solutions if I want to move to solution B. This is a bit like when I buy a Prius, I cannot drive a Volt. But it would be nice if I can use the same garage, loading cable, GPS, etc. when I switch. 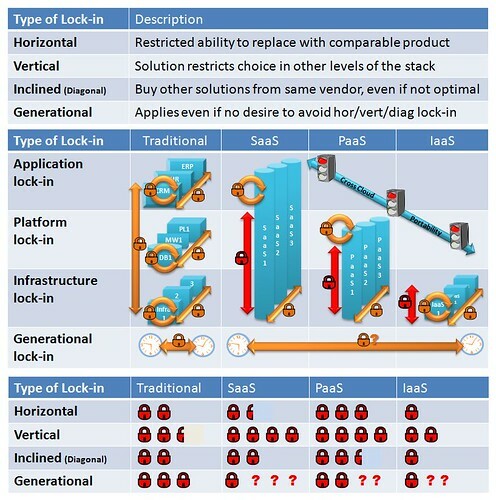 Vertical lock-in: This restricts choice in other levels of the stack and occurs if choosing solution A mandates use of database X, operating system Y, hardware vendor Z and/or implementation partner S. To prevent this type of lock-in the industry embraced the idea of open systems, where hardware, middleware and operating systems could be chosen more independently. Before this time hardware vendors often sold specific solutions (like CRM or banking) that only ran on their specific hardware / OS etc. and could only be obtained in their entirety from them. So a bit like today’s (early market) SaaS offerings, where all needs to be obtained from one vendor. Diagonal (of inclined) lock-in: This is a tendency of companies to buy as many applications as possible from one provider, even if his solutions in those areas are less desirable. Companies picked a single vendor to make management, training and especially integration easier but also to be able to demand higher discounts. A trend that let to large, powerful vendors, which caused again higher degrees of lock-in. For now we call this voluntary form of lock-in diagonal Lock-in (although “inclined”- a synonym for diagonal – may describe this better). Generational lock-in: This last one is as inescapable as death and taxes and is an issue even if there is no desire to avoid horizontal, vertical or diagonal lock-in. No technology generation and thus no IT solution or IT platform lives forever (well, maybe with exception of the mainframe). The first three types of lock-in are not too bad if you had a good crystal ball and picked the right platforms (eg. Windows and not OS/2) and the right solution vendors (generally the ones that turned out to become the market leaders). But even such market leaders at some point reach end of life. Customers want to be able to replace them with the next generation of technology without it being prohibitively expensive or even impossible because of technical, contractual or practical lock-in. How does cloud computing, with incarnations like SaaS (software as a service), PaaS (platform as a service) and IaaS (infrastructure as a service) impact the above? In the consumer market we see people using a variety of cloud services from different vendors , for example Flickr to share pictures, Gmail to read email, Microsoft to chat, Twitter to Tweet and Facebook to … (well, what do they do on Facebook? ), all seemingly without any lock-in issues. Many of these consumer solutions now even offer integration amongst each other. Based on this one might expect that using IT solutions “as a service” in an enterprise context also leads to less lock-in. But is this the case? Horizontal: For the average enterprise moving from one SaaS solution to another is not so different from moving from a traditional software application to another, provided they agreed whether and how their data can be transferred. What does help is that SaaS in general seems easier and faster to implement and that it is not necessary for the company to have two sets of infrastructure available when migrating. For PaaS it is a very different situation, especially if the development language is proprietary to the PaaS platform. In that case, the lock-in is almost absolute and comparable to the lock-in companies may have experienced with proprietary 4GL platforms, with the added complexity that with PaaS also the underlying infrastructure is locked-in (see under vertical). Horizontal lock-in for IaaS may actually be less severe than lock-in to traditional hardware vendors as virtualization – typical for any modern IaaS implementation – isolates from underlying hardware differences. Provided customers do not lock themselves in to a particular hypervisor vendor, they should be able to move their workloads relatively easy between IaaS providers (hosting companies) and/or internal infrastructure. A requirement for this is that the virtual images can be easily converted and carried across, a capability that several independent infrastructure management solutions now offer. Even better would be an ability to move full composite applications (more about this in another post). Vertical: For SaaS and PaaS vertical lock-in is almost by definition part of the package as the underlying infrastructure comes with the service. The good news is the customer does not have to worry about these underlying layers. The bad news is that if the customer is worried about the underlying layers, there is nothing he can do. If the provider uses exotic databases, dodgy hardware or has his datacenter in less desirable countries, all the customer can do is decide not to pick that provider. He could consider contracting upfront for exceptions, but this will in almost all case will increase the cost considerably, as massive scale and standardization are essential to business model of real SaaS providers. On the IaaS side we see less vertical lock-in, simply because we are already at a lower level, but ideally our choice of IaaS server provider should not limit our choice of IaaS network or IaaS storage provider. For storage the lesson we learned the hard way during the client server area -for enterprise applications logic and data need to be close together to get any decent performance – still applies. As a result the storage service almost always needs to be procured from the same IaaS provider as used for processing. On the network side most IaaS providers offer a choice of network providers, as they have their datacenter connected to several network providers (either at their own location or at one of the large co-locators). Diagonal or inclined: The tendency to buy as much as possible from one vendor may be even stronger in the cloud than in traditional IT. Enterprise customers try to find as single SaaS shop for as many applications as possible. Apart from the desire for out of the box integration, an – often overlooked – reason for this is that customers need to regularly audit the delivery infrastructure and processes of their current SaaS providers, something which is simply unfeasible if they would end up having hundreds of SaaS vendors. For similar reasons we see customers wanting to buy PaaS from their selected SaaS or IaaS vendor. As a result vendors are trying to deliver all flavors, whether they are any good in that area or not. A recent example being the statement from a senior Microsoft official that Azure and Amazon were likely to become more similar, with the first offering IaaS and the second likely to offer some form of PaaS soon. In my personal view, it is questionable whether such vertical cloud integration should be considered desirable. The beauty of the cloud is that companies can focus on what they are good at and do that very well. For one company this may be CRM, for another it is financial management or creating development environments and for a third it may be selling books – um, strike that – hosting large infrastructures. Customers should be able to buy from the best, in each area. CFOs do not want to buy general ledgers from CRM specialists, and for sure sales people don’t want it the other way around. Similar considerations apply for buying infrastructure services from a software company or software from an infrastructure hosting company. At the very least this is because developers and operators are different types of people, which no amount of “devops training ” will change (at least not during this generation). Generational: As with any new technology generation people seem to feel this may be the final one: “Once we moved everything to the cloud, we will never move again.” Empirically this is very unlikely – there always is a next generation, we just don’t know what it is (if we did, we would try and move to it now). The underlying thought may be: “Let the cloud vendors innovate their underlying layers, without bothering us”. But vendor lock-in would be exactly what would prevent customers from reaping the benefits of clouds suppliers innovating their underlying layers. Let’s face it, not all current cloud providers will be innovative market leaders in the future. If we were unlucky and picked the wrong ones, the last thing we want to be is locked-in. In today’s market picking winning stocks or lotto numbers may be easier then picking winning cloud vendors (and even at stock picking we are regularly beaten by not very academically skilled monkeys). My goal for this post was to try and define lock-in, understand it in a cloud context and agree that it should be avoided while we still have a chance (while 99% of all business systems are not yet running in the cloud). Large scale vertical integration is typical for immature markets – be it early-day cars or computers or now clouds. As markets mature companies specialize again on their core competencies and find their proper (and profitable) place in a larger supply chain. The lock-in table at the end, where I use the number of padlocks to indicate relative locking of traditional IT versus SaaS, PaaS and IaaS, is more meant for discussion and improvement than as an absolute statement. In fact our goal should be to reduce lock-in considerably for these new platforms. In a later post I will discuss some innovative cross cloud portability strategies to prevent lock-in when moving large numbers of solutions into the cloud, stay tuned. PS Not that I for a minute think my blogs have any serious stopping power, but do not let the above stop you from moving suitable applications into the cloud today. It’s a learning experience that we will all need as this cloud thing gets serious for serious enterprise IT (and I am absolutely sure it will, as the percentage of suitable applications is becoming larger every day). Just make sure you define an exit strategy for each first, as all the industry analysts will tell you. In fact, even for traditional IT it always was a good idea to have an exit strategy first (you did not really think these analysts came up with something new, did you?). CA Community is the blog manager’s account used to post general updates and news items.